Our phones are forwarded to Outagamie County Dispatch Center. Advise them of your situation and a Hortonville Police officer will be dispatched to assist you. You can call 920-832-5000 directly to reach the Outagamie County Dispatch Center. You must pay the ticket within 10 days as stated on the parking ticket. if it isn't paid within 10 days the ticket will be considered "overdue" and the fine will increase. Refusing to pay the citation within 20 days will result in registration suspension for the vehicle on which the citation was issued. Fill out the backside of ticket seal it, add a stamp to the designated area and put it in the mail. Put it in one of the village drop boxes one is located outside the municipal center by the library book drop and one inside the the municipal center by the medicine Dropbox by the police department. Does the Police Department do fingerprinting and when can I get mine done? The Police Department will fingerprint individuals for a $10.00 fee. If requesting fingerprints after hours, please use the phone in our waiting area. Instructions are posted. An officer will respond to assist you. Your wait time will depend upon the availability of our on duty officer. Where can I get a copy of my accident report? 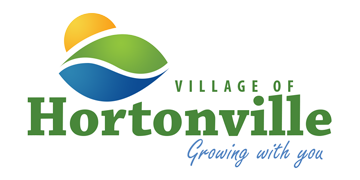 Accident reports are available at the Hortonville Police Department. You will need to fill out an open records request to obtain a report. You can also obtain an open records request form on this website and email your request to Jmschuh@hortonvillepd.com. Access your police report at: WI Crash Reports to get a copy. Reports will typically show up on the website 3-5 days after the accident. You will need your driver's license number and date of accident. The state does charge a fee for the report. When Placing a refrigerator on the curb do I have to remove the doors? Yes! All abandoned refrigerators or iceboxes from which the doors and other covers have not been removed or which are not equipped with a device for opening from the inside can NOT be placed on the curb! Someone is Soliciting Magazines, meats, or other items door to door. Can they do that? Yes, if they have a village issued solicitor’s license. If you wish to verify the license you can call the Municipal Clerk's office during regular office hours at 920-779-6011. Can I light off fireworks in the Village? No person shall sell, expose or offer for sale, use, keep, discharge or explode any fireworks, except toy pistol paper caps, sparklers and toy snakes, within the Village limits unless authorized by a fireworks permit as hereinafter provided. The term "fireworks" as used in this section shall be deemed to include all rockets or similar missiles containing explosive material or fuel. Does the Police Department respond to requests for patches? The Hortonville Police Department has collected and traded patches for many years. However, due to increased security measures and ever increasing expenses both in dollars and time, we are no longer trading or selling patches. Can i drive my scooter on the roadway or sidewalks? Can I operate a snowmobile in the Village? Yes, on designated marked trails only. Riding the ditches is not permitted within the village limits. Contact your local DNR agent for permitted locations. Does the Village have a curfew? Yes. Curfew for children aged 17 and under is 11 PM to 5AM. I locked my keys in my car. How can I get help? Call the Hortonville Police Department at 920-779-6165. I'm going on vacation. Can the Police Department watch my house? Yes. Call us at 920-779-6165 or stop by the police department to request a vacation watch. Contact the Clerk of Courts in the county you reside in. Whom do I report boating violations/complaints to? You may contact your local Sheriff's Department or DNR. Where can I drop my expired Prescriptions? We have a drug drop box inside the municipal service center right outside the Police Department. Do cats and dogs have to be licensed? Dogs must be licensed by April 1st or before if April 1st falls on a weekend. Proof of current rabies shots must be presented at the Municipal Building to obtain a license. Licenses are not required for cats. How many dogs and/or cats are allowed? This provision does not apply to the breeding or caring of farm animals or to domestic pets on agriculturally zoned land of five (5) acres or more. This provision does not apply to any premises holding a valid kennel license. This provision does not apply to the keeping of small caged birds (exclusive of pigeons), small caged animals, reptiles, or aquatic or amphibian animals, solely as pets. All animals that are not domestic, as defined above, are prohibited. For loose and injured dogs call the Hortonville Police Department. All stray and injured dogs are taken to the Fox Valley Humane Association in Appleton at 920-733-1717. For stray or injured cats, call the Fox Valley Humane Association for availability of room. You will be responsible for transporting the cat to the vet clinic. For injured wildlife call the Mosquito Hill Nature Center at 920-779-6433.